This week’s Key Piece is The Scream (Skrik) by Norwegian artist Edvard Munch. It is one of the leading piece of the Expressionist movement, so without further let’s discover ten facts about the painting. 1. It exists five versions of The Scream, three paintings, one pastel and one lithograph. They all were created by Edvard Munch in between painted in 1893 and 1917. 2. The painting represents the modern man having an existential anxiety crisis. 3. The painting is part of Munch’s ‘Frieze of Life’ series in which sickness, death, fear, love and melancholy are central themes. 4. The artwork is painted in a true expressionist manner with bright spinning colors that express a chaotic emotional state. 5. The central character is inspired by a Chachapoyas mommy from Peru that Munch saw during an exhibition in Paris. 7. 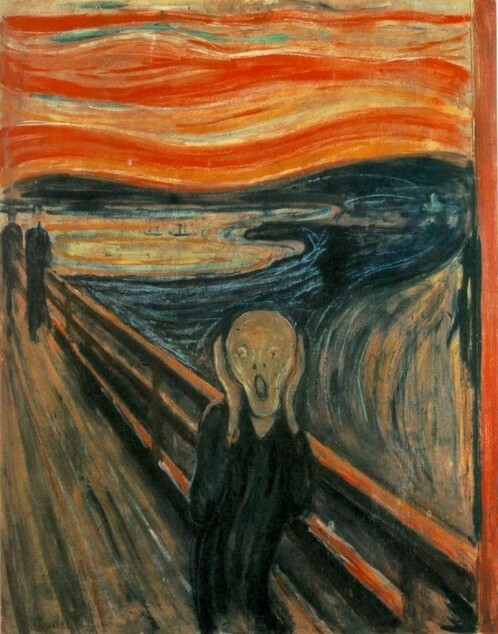 In 1994, The Scream from the Oslo National Gallery was stolen. It was fund 4 months later in Norway. 8. One of the three The Scream painting was sold $119 million at Sotheby’s in 2012. 9. The character Ghostface from TV show Scream is directly inspired by Munch’s painting. 10. The painting inspired many popular culture references such as TV Show The Simpson, Japanese anime Naruto and animation movie Persepolis.